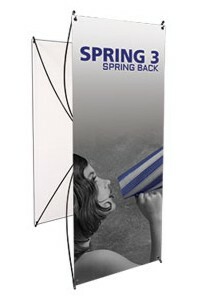 The Spring 3 is a great banner for promotions and tradeshows. It can be used as both a single sided and double-sided unit. (All parts are included for either option). attachment. Comes in a Black finish and includes a carry bag. #3 grommets in corners. Hardware Only.